Works with: Astro 430 & Alpha 100 Handheld Units. Preloaded TOPO 100K -FREE Lifetime Maps. Follow the hunt from your personal. 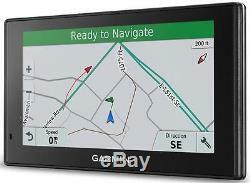 Vehicle, allowing you to see the big picture with the Garmin DriveTrack 70LMT, 7.0-Inch color map display. 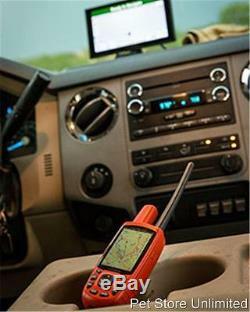 The GPS Navigation, Wireless Link Technology, lets you track each dogs location on and off-road areas. The Wireless Garmin DriveTrack works with Astro 430 & Alpha 100 handheld units. Displayed markers for each dog you are tracking displayed on TOPO US 100K satellite image views. The easy to read display uses directional cues to locate and follow every dog. Bluetooth®-enabled Garmin GPS combines the latest in driver alerts, voice-activated navigation, lifetime maps of North America, free lifetime traffic, Active Lane Guidance and much more. When youre on the road, Garmin DriveTrack dog tracker and GPS navigator provides driver alerts to encourage safer driving and increase situational awareness. Warnings include alerts for sharp curves, speed changes, railroad crossings, animal crossings and more. Additionally, the unit gives a heads-up if youre driving the wrong way on a one-way street - and also sends warnings when approaching nearby school zones. Receive alerts for nearby red light and speed cameras, be prepared for sudden halts in traffic with upcoming traffic jam alerts. For longer drives, a fatigue warning suggests break times and potential rest areas after hours of driving. The Up Ahead feature shows places and milestones along your route - right on your navigation display - to help you know whats ahead before you reach your destination. Garmin Traffic can give details about the situation, such as how many minutes of delay to expect and if there are any possible detours. It can even confirm whether or not you are on the fastest route. Garmin Traffic is delivered straight to your Garmin DriveTrack. Garmin DriveTrack redefines spoken turn-by-turn directions with Garmin Real Directions, easy-to-understand driving directions that guide like a friend, using recognizable landmarks, buildings and traffic lights e.
Turn right after the red building or Turn left after the QT. Its preloaded with millions more new and popular places, thanks to Foursquare. Find Exactly Where You Need to Go. Direct Access feature on Garmin DriveTrack simplifies navigating to select complex destinations, like airports and shopping malls, by finding a place within a larger location. Direct Access even navigates through parking lots to find the entrance nearest your destination. When navigating to the mall, Direct Access gives additional location information for specific retail stores inside. For example, Arriving at Woodfield Mall. Champs Sports is inside, on the lower level. 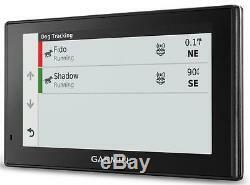 Use Garmin Express to keep your Garmin DriveTrack dog tracker and GPS navigator up to date. Garmin Express makes it easy to update maps and software, transfer favorites to and from devices and install free custom vehicles and voices. Works & Compatible w/ Astro 430 & Alpha 100 Handhelds. Alpha 100 download free software. Designed to track dogs from a vehicle. Physical dimensions 7.4"W x 4.4"H x. Display size, WxH 6.0"W x 3.4"H. Display resolution, WxH 800 x 480 pixels. Display type WQVGA color TFT with white backlight. 7.0 inch pinch-to-zoom display. 100K & 1-Year subscription to Birds Eye satellite imagery. Detailed road maps of North America. Displays GPS signal strength; remaining battery life on dog collars. FREE lifetime maps, traffic updates, driver alerts for upcoming sharp curves & speed changes. USB mass storage device is compatible with Windows® XP or newer and Mac® OS X 10.4 or later. Comes with suction cup mount, vehicle power cable, and USB cable. 100K maps and detailed street maps of North America. FREE Lifetime maps and traffic. Traffic antenna / vehicle power cable. We Have Item IN STOCK! We are a Small Family Owned Business.. We Thank You for your business. We Love Our Pets As Much As You Love Yours... Pamper Your Pets with Us. Your 100% Satisfaction is Guaranteed. Kings Mills, Ohio 45034 M-Sat. Shop here and save up to 40% on Pet Supplies, including Bark Collars, Dog Training Collars, Electric In-Ground Pet Fence, Pet Barrier Deterrents, Invisible Fence & PetSafe Batteries, Accessories and more. 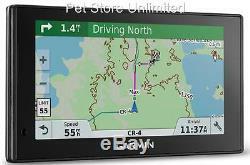 The item "Garmin DriveTrack 70LMT GPS Navigation Astro 430 / Alpha 100 FREE Lifetime Maps" is in sale since Sunday, May 07, 2017. This item is in the category "Pet Supplies\Dog Supplies\Training & Obedience\Other Dog Training & Obedience". The seller is "marty45034" and is located in Kings Mills, Ohio. This item can be shipped to United States.